Makers provides a 12 week, full-time, on-site course in London, that costs £8,000. After your three months with us, you will be ready to start work as a junior developer with one of our hiring partners. We're so confident you'll be employed, we have a job offer guarantee. Get the ball rolling with a few basic details. Fill out the application form. If you have tried your hand at coding before (with online courses, for example), we will invite you for an in-person interview and pair programming session. Do a pair programming session with a member of our admissions team - either in our office in Shoreditch, or remotely online. If you don't pass your interview the first time, don't worry - you can repeat it. If your interview is successful, we ask you to pay the deposit as soon as possible. Cohorts fill up fast, and when your deposit arrives, we will start sending you some materials to prepare for the course. You will receive pre-course materials on the day your pre-course starts. The pre-course is an online, part-time course that will make sure every developer starts the course with the same knowledge. We ask you to pay the remaining amount of your course fees on the day your pre-course starts. 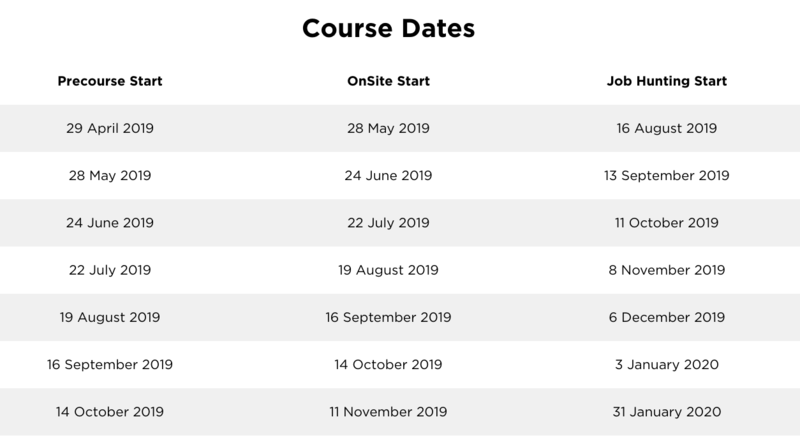 You will be doing the onsite course for 3 months. This will be every weekday, 9-5, with weekend challenges. Once you passed your review at the end of your course, you can start applying to jobs with our hiring partners.